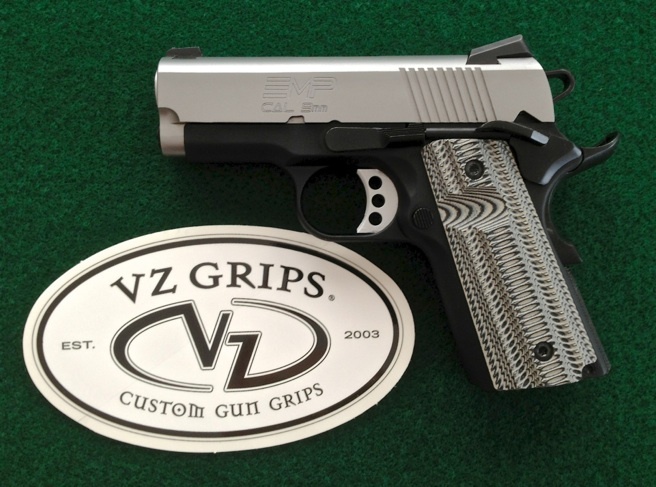 Upgrading the grips on a 9mm Springfield EMP 1911 with some Alien Black Desert Sand G10 Grips from VZ Grips. Options on the custom grips include thumb notch/mag release relief. 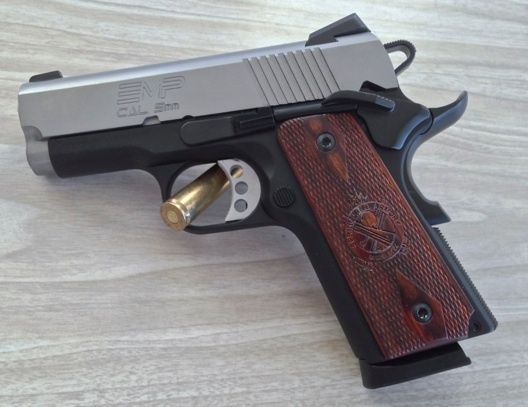 The Springfield EMP 9mm is a very compact 1911 style firearm. The factory wood cocobolo grips look good but I have large hands and since there is no front strap checkering I felt that I just didn’t have a good grip on the gun. I tried the factory grips with about 250 rounds – using various loads and bullet types (I didn’t experience any failures – not even a mis-feed – this is a solid platform!) and I confirmed my initial thinking. I fixed my problem with a custom set of Alien Black Desert Sand G10 grips from VZ Grips. VZ Grips EMP Alien in Black Desert Sand G10 Grips Custom made to fit for the EMP with the added upgrade option for Thumb Notch and Mag Release. The grip upgrade couldn’t be more easy! A T-15 Torx driver is all that is needed to remove the factory grips. Comparison of the factory wood grips to the new Alien VZ Grips.